As always, I'll share excerpts from my Yellowstone trip report in this thread. Check back for updates every couple days, with links to the full posts and more images. I’m leading an extended tour this week in Yellowstone and the Grand Tetons. I purposely limited this trip to a smaller group, and looks like it’s going to be a fun week. We began at a normal time Sunday morning, heading for the northeast as the sky slowly brightened. Elk grazed in the darkness at Mammoth as we drove through. There weren’t many reasons to stop as we made it all the way to Petrified Tree, so I finally pulled over for a lonely bison bull in order to let my clients stretch their shutter fingers a bit. Things picked up after that. 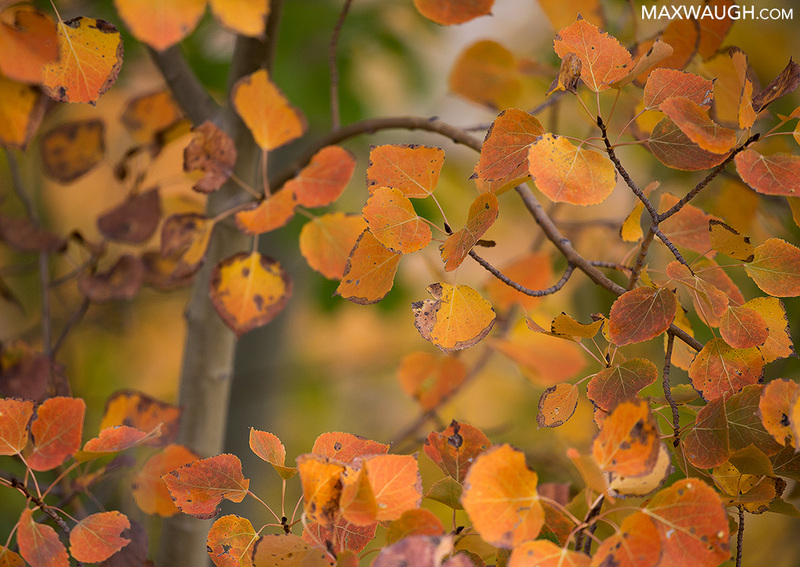 One of our other early stops was for a landscape opportunity, as we honed in on the changing aspens. Some already sported orange leaves. And yes, we caused a leaf jam. Read the full report from Days 1 & 2 and see more photos in the blog. Last edited by Max on Fri Sep 28, 2018 10:14 pm, edited 3 times in total. Thanks for the report, Max. I checked out the rest of it on your blog and particularly liked the bull elk silhouette. I’m looking forward to reading about the rest of your trip. Thanks, Max. Sounds like a lot of fun and the photos were great. I'll be watching for the next update! Tuesday was a transition day. We packed up and stuffed the SUV for our move to the Tetons. On the way, of course, more Yellowstone! Who’d have thought that the “geyser day” on this tour would end up being by far the most active and fun day (so far). Since we were heading south, our plan was to work the west side of the park, visiting a number of areas my clients had yet to experience, including the first geysers for many of them. Before we got to the thermals, we lingered up north, driving up above Mammoth to get to Swan Lake Flat for sunrise. A couple of frosty bison greeted us, as did the setting moon, which slid behind a wispy cloud and a mountainside soon after we arrived. The lingering cloud cover on the horizon appeared to be thinning a bit, so I was hopeful that we’d get a good sunrise. First, we drove down to Sheepeater Cliff for a quick wildlife check before returning to the flats. The mountaintops began to glow as I veered into a pullout. To the east, I spied some distant elk and one very large bull. While my clients concentrated on sunlit peaks, I kept an eye on the action behind us. The bull crested a small hill before disappearing into the trees. Just then, the sun broke free and lit up the entire frosty flats in a warm glow. I knew there was potential for a pretty good wildlife shoot, but we’d have to go find those elk first. I gathered up the troops, along with our long lenses, and we trekked into the sage. After a couple hundred yards, we finally got to a high enough vantage point to see the far flats. A large bull billowed steam as he bugled. A few cows stood nearby, backlit in dramatic light. Much closer to us, more bugling erupted from the nearby trees, where the first bull I spotted had vanished. It turned out he had a large harem sequestered there. Soon, they were on the move. 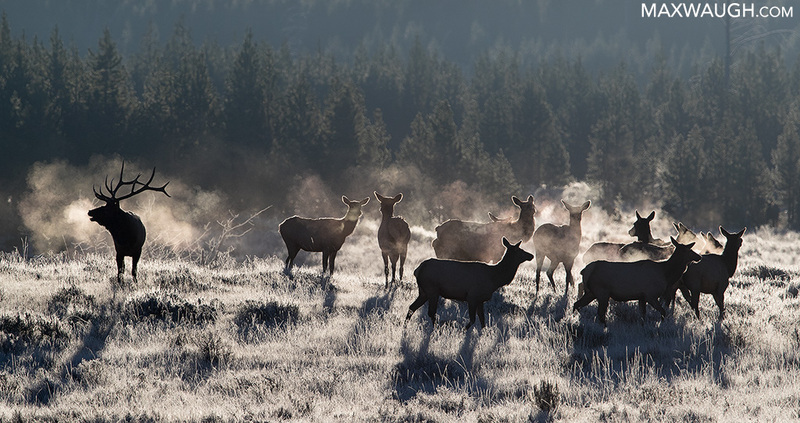 It was tough to choose which way to shoot, as the larger gathering of elk was front or side lit, while the more distant elk to the east were backlit. So many choices, and no bad options. Eventually the closer bull and his cows trotted eastward toward the others. It looked like we’d be forced to photograph silhouettes, and lots of glowing clouds of steamy breath. What a pity. Read the full report from Days 3 & 4 and see more photos in the blog. Thursday we were supposed to take a break from the classic sunrise shoots in the Tetons and focus on wildlife, yet we still found ourselves down at Schwabacher Landing first thing in the morning. Mainly because I had received a report of beaver and otter activity near there during the previous morning. Having photographed beavers near the landing before, I thought we had a good shot. We probably got some strange looks passing the throng of little lenses with our “big guns” in tow, but we soon moved beyond the crowd as we tracked the waterway north around the bend. Unfortunately, there didn’t appear to be any rodent or mustelid action. Just ducks. I even went so far as to scout ahead through the trees, getting all the way to the river before turning back. No signs of mammalian life. 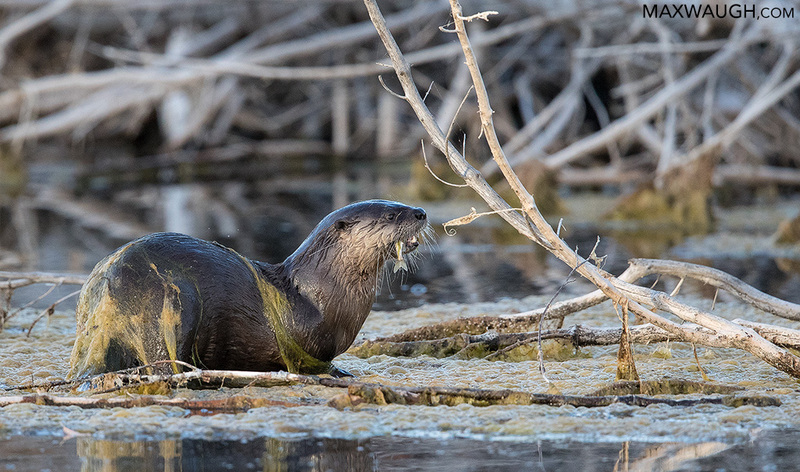 I’m pretty sure my clients were beginning to question me at this point… when I spied an otter back closer to our starting point. Read the final trip report from the fall 2018 tour in the blog. Thanks for the trip reports. I really enjoy them. It is nice to hear the good sightings and lack of sightings. Then I don’t feel so bad when I have bad photographic days. I was happy to see I have a chance to see a mountain goat on the Beartooth! We will be doing the trip late August this year. Also sad there won’t be snow on the Tetons. Your photos are absolutely wonderful!